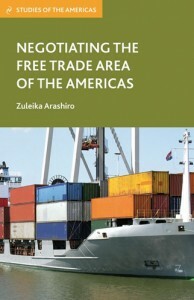 The first detailed historical account of the Free Trade Area of the Americas (FTAA) negotiations, this book covers the genesis of the project in the early 1990s to its demise in late 2003. It examines how the FTAA, an Inter-American policy idea, was incompatible with the predominant ideas and beliefs of Brazilian and American decision makers as to how they could and should conduct their countries’ foreign trade policy in the Western Hemisphere. Arashiro, Zuleika. Negotiating the Free Trade Area of the Americas. Palgrave, 2011.